Prior to securing the renal hilum, the patient is given 5000 U of intravenous heparin sulfate. With the renal vessels on gentle traction, the renal artery is transected flush with the aorta with a linear endovascular stapler or Hem-O-Lok clips (Fig. 10| ■ The endovascular TA stapler or Hem-O-Lok clips will secure the patient side of the renal artery while leaving the graft side of the vessel open. This will maximize arterial length, because graft-side staples that are placed with the Endo-GIA stapler have to be excised by the recipient surgical team (22). FIGURE 10 ■ The kidney with the divided ureter is gently placed into a 15-mm Endocatch® bag. The skeletonized renal vessels are placed on gentle traction for division. Transection of the renal artery (RA) using an Endo-GIA® stapling device. The renal vein (RV) will then be divided medial to the adrenal vein stump. FIGURE 11 ■ Delivery of the kidney within the Endocatch bag via the Pfannenstiel incision. It is critical to avoid previously placed clips on the adrenal and lumbar veins when placing a stapling device on the renal vein. A misfire on the renal vein will result in almost certain open conversion, because the renal vein stump will retract anterior to the aorta and be difficult to control laparoscopically. If multiple renal arteries are present, each should be transected prior to transection of the renal vein(s). 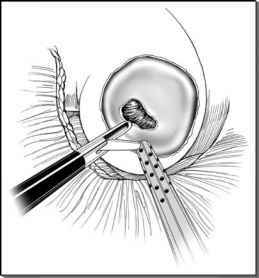 The allograft should not be forced through an incision too small to accommodate it. arterial anastomosis. Also, avoiding the Endo-GIA stapling device creates a safety net to avoid possible stapler misfire (21). With the Endo-TA or Hem-O-Lok clips, the security of the patient-side staples or clips can be observed prior to vessel transection. After transection of the renal artery, anticoagulation is reversed with 50 mg protamine intravenously. This is followed by immediate transection of the renal vein as far medial from the adrenal vein stump as possible, affording maximal vessel length. It is critical to avoid previously placed clips on the adrenal and lumbar veins when placing a stapling device on the renal vein. A misfire on the renal vein will result in almost certain open conversion, because the renal vein stump will retract anterior to the aorta and be difficult to control laparoscopically. If this happens, pressure should be applied in the area of the vein stump and the allograft delivered through the extraction site. Once the kidney is safely extracted, an appropriate incision is made to obtain hemostasis. If multiple renal arteries are present, each should be transected prior to transec-tion of the renal vein(s) (23). Small accessory renal vessels (less than 2 mm) may be sacrificed after consultation with the recipient surgical team.